PLATE 1. “Young Matt” (Caleb Odenthal) fights the Baldknobbers. Photo by Beckie Fairchild. “Do they think this is the end?” Dave Wallace wondered as he looked over an audience rising to their feet. The applause was long and lasting as the house and cast wiped away tears. Wallace was crying as well. Wallace, though only 35, had been given the role of the paternal “Shepherd” in a production created by composer Stan Beard and Dr. Hayden Head and based on Harold Bell Wright’s 1907 book The Shepherd of the Hills. 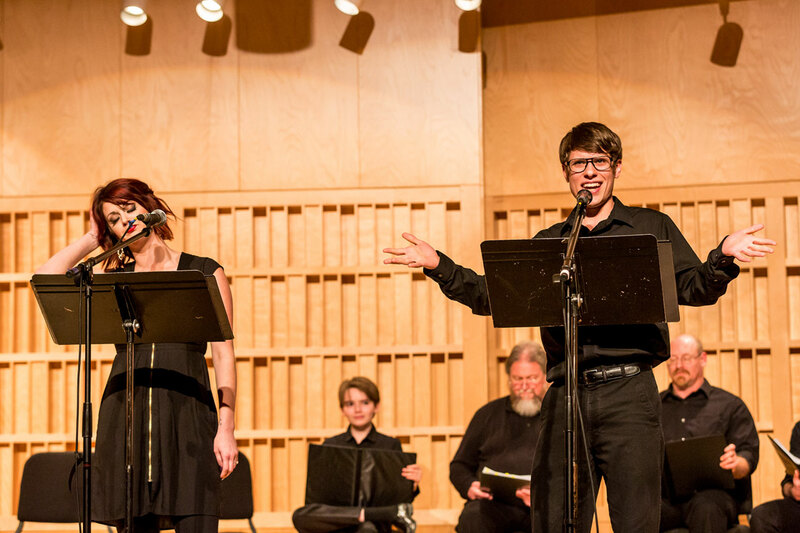 This night, the production (simply titled Shepherd the Musical) was getting a run-through of sorts — a concert reading in Gittinger Recital Hall on the campus of College of the Ozarks. The community had been invited in force. 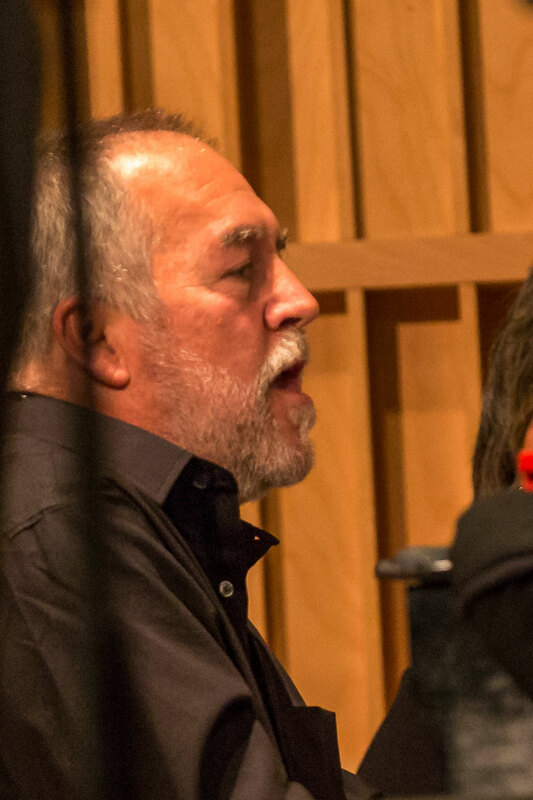 Beard, whose work as musical director and composer includes the long-running Silver Dollar City productions A Dickens Christmas Carol, Headin’ West, and It’s A Wonderful Life, was at the piano, having written the score and led the premiere’s direction. PLATE 2. 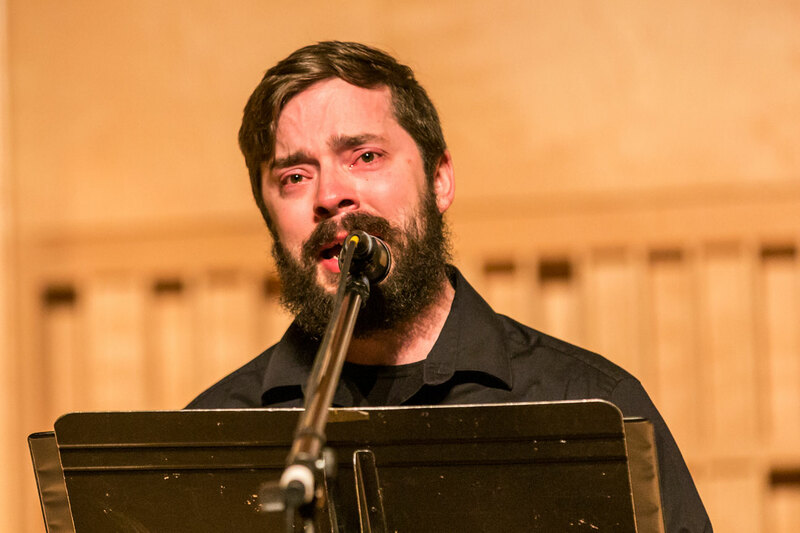 “The Shepherd” (Dave Wallace) in tears over the death of his son “Howard.” Photo by Beckie Fairchild. When Beard was first contacted by Dr. Hayden Head, the composer was not familiar with Wright’s work. “When I finally read the book,” he notes, “I couldn’t believe when it was written!” The book was a best-seller when released early in the 20th century. Many, however, feel the novel resonates with timeless themes. Matters of patience, faith, humility and challenge resonate throughout the lives of those involved in the production as well as the novel itself. Further, Wright addressed difficult issues that speak to a modern audience — depression, broken relationships, teen pregnancy, illegitimate children, even mental health. PLATE 3. “Pete” (Captain Sibley) captures the audience with “Pete’s Song.’ Matthew James and Dan Embree look on. Photo by Beckie Fairchild. PLATE 4. 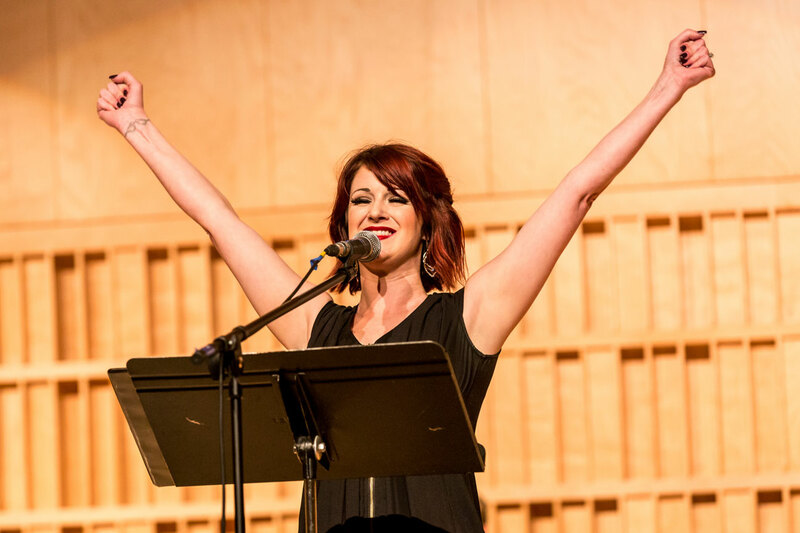 “Sammy Lane” (Kaylee Ruden) concludes a celebratory moment. Photo by Beckie Fairchild. The role of “Pete” went to the sublimely gifted yet understated Captain Sibley of Springfield, also known for his role of “Tiny Tim” in A Dickens Christmas Carol. “He’s just an unbelievable young talent,” says Beard. Yet simultaneously Wright lyrically wrote of the Ozarks as a beautiful and serene place — a place of rest and spiritual healing. 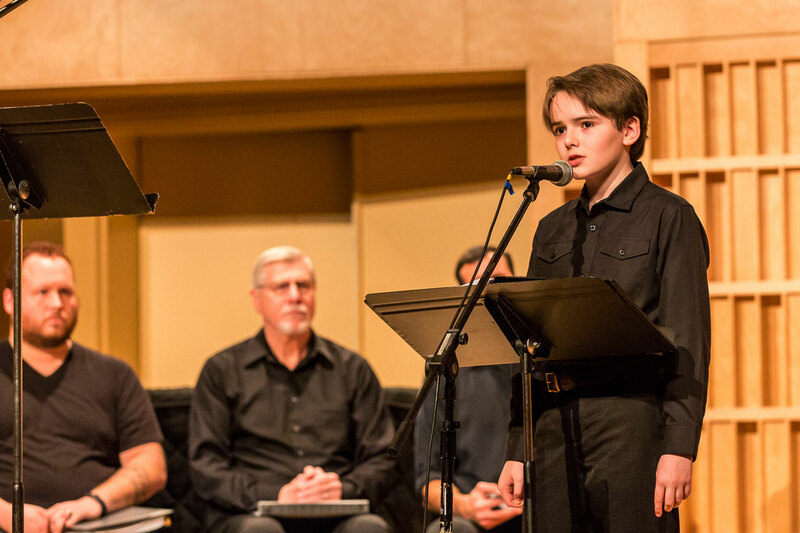 Both subjects are explored through the song, “These Hills Ain’t What You’re Lookin’ For.” The men of the cast sing of the hardships and trials while the women echo the beauty and peace. PLATE 5. Urban dandy “Ollie Stewart” (James Zeller) takes a darker turn during the song “Good Bye & Good Riddance.” Photo by Beckie Fairchild. The pain of an internal struggle or private trial is also heady subject matter in the hands of Wright — a theme furthered by Beard and Head’s empathy. PLATE 6. “Young Matt and Sammy Lane” (Caleb Odenthal and Kaylee Ruden). Photo by Beckie Fairchild. PLATE 7. “Harry the Photographer”(Kevin Day) moves the story forward. Hand-made camera prop created by craftsmanand wagoneer Louis Allen of Rockaway Beach. Photo by Beckie Fairchild. PLATE 8. “Ollie Stewart” (James Zeller) attempts to woo “Sammy Lane” (Kaylee Ruden). Photo by Beckie Fairchild. Head understood the pain of death and found a beautiful and passionate sorrow in the words “the taste of tears and the smell of rain,” words which worked their way into the song lyrics and the audience’s hearts. Even so, the artistic creation of the music was not, initially, an easy one. “At one point,” confides Beard, “I told Hayden, ‘I don’t think I’m going to be able to continue this project. But when I sat down [at the piano] I said, ‘Okay, let’s see if I can write one line,’ and literally within a bit more than a day, I wrote the rest of the score. PLATE 9. “Wash Gibbs” (Robert Montgomery) sings “The Baldknobbers.” “They showed me a picture of the person they believe Wash Gibbs was written about. He was a very slender man with piercing eyes. And I realized that he was a lot more sinister than any interpretation I could have ever thought of,” shares Montgomery. Photo by Beckie Fairchild. 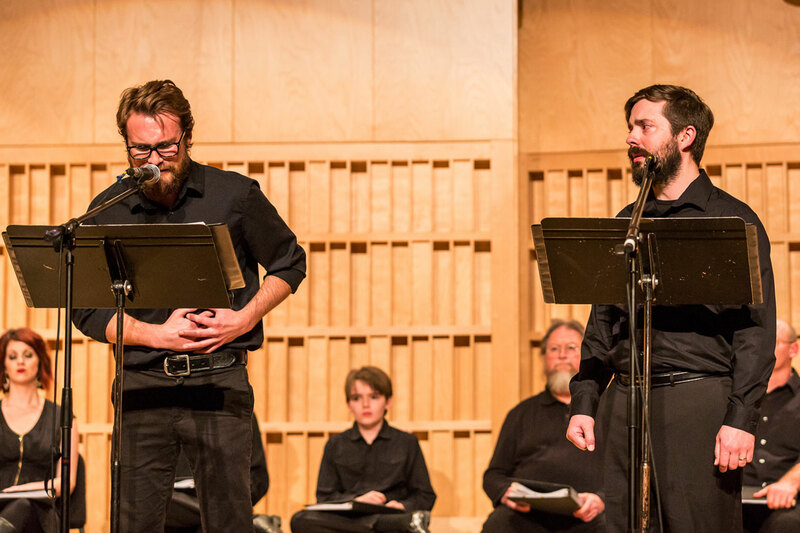 Beard’s calling culminated in a brilliant piece of work and the audience responded enthusiastically to the minimalist presentation of the concert reading. There were few props. 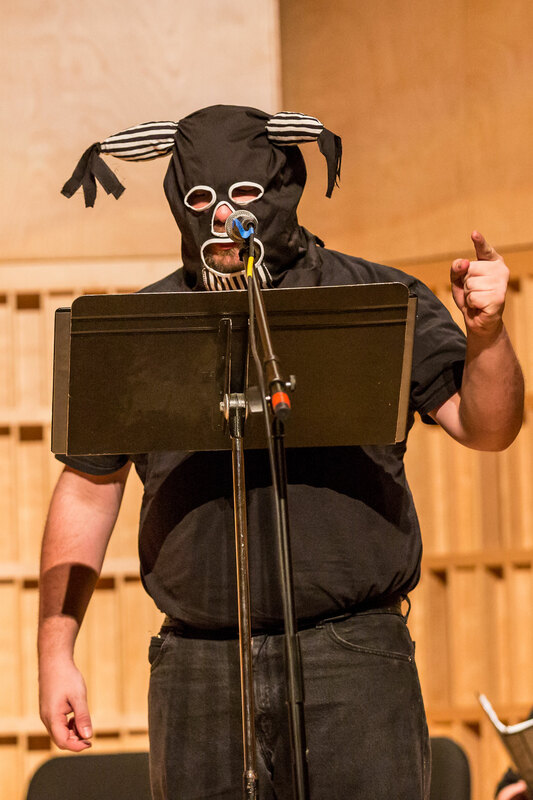 The actors, dressed in black, faced the audience. “When everything is stripped away, it makes you dig deeper in the script. It makes you dig deeper in the music. It makes you work hard to bring out the emotions,” explains Matthew James, a Silver Dollar City vocalist with a degree in musical theater. Extraordinary focus was placed on the humanity of the characters. 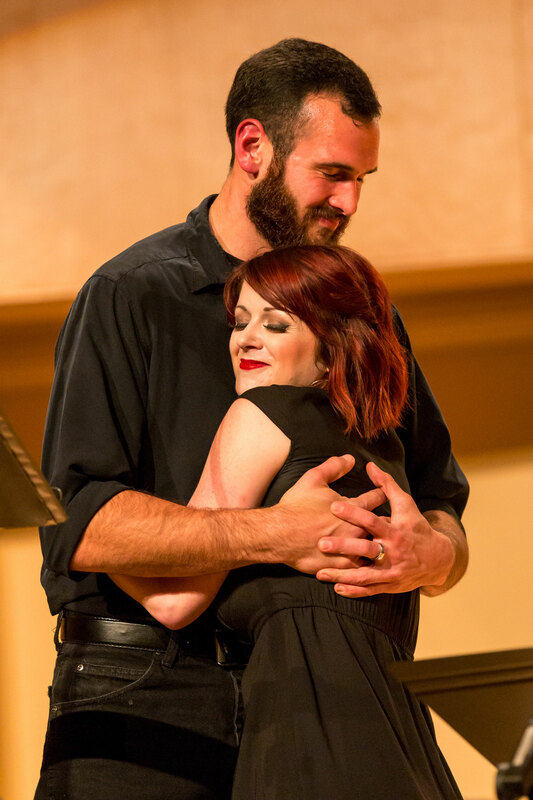 “Hayden has done a very good job of capturing honest words and real emotion throughout the whole of the show,” continues Dave Wallace who, as “The Shepherd,” was called upon to carry the weight of the show’s emotions during the second half. PLATE 10. Stan Beard, musical director, plays piano throughout the performance. Photo by Beckie Fairchild. “The words Hayden wrote are so simple but the power is undeniable.” Wallace stands, facing the audience, tears streaming down his face as he discovers his son “Howard,” (Jonathan Beard) is dying. The audience rose to their feet, wiping tears. The applause broke the tension, surprising even the cast. PLATE 11. “Howard” (Jonathan Beard) and “The Shepherd” (Dave Wallace) share a powerful moment. Captain Sibley and Kerry Richardson look on. Photo by Beckie Fairchild. PLATE 12. 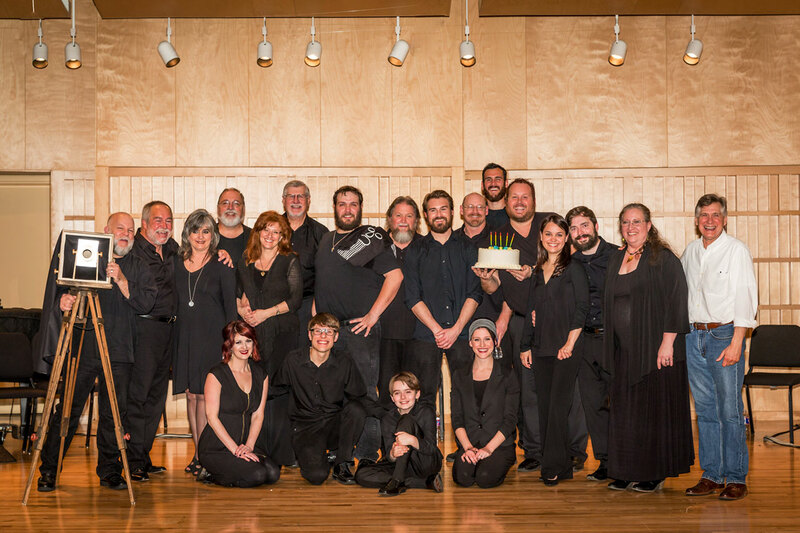 Shepherd the Musical Cast (BACK ROW, FROM LEFT): Kevin Day, Stan Beard, Tina Sibley, Mark LeTorneau, Dana Embree, Dan Embree, Robert Montgomery, Kerry Richardson, Jonathan Beard, Mike Tilden, Caleb Odenthal, Matthew James, Rachel Wallace, Dave Wallace, Karen Richardson and Dr. Hayden Head. FRONT ROW, FROM LEFT: Kaylee Ruden, James Zeller, Captain Sibley and Jillian Beard. PHOTO BY BECKIE FAIRCHILD. Emotions were high and it was hard to imagine a dry eye in the house. “The Believe piece is really the emotional zenith of the show but it’s not the finale,” Beard insists warmly. “Life is a collection of moments,” observed Wallace with a shepherd-like wisdom far beyond his 35 years. “There was something in those scenes with Howard, the intimacy of our faces unabashedly facing the audience. It’s something we all shared because it is a human story: Everyone has loved ones that have gone away. Everyone has forgiveness they’ve needed. And forgiveness they’ve given. And it’s all worthwhile. Every bit of it. Outside the brightly lit music box of a recital hall and beyond the noise of the applause, a light mist fell. The Ozark hills of which Wright wrote so eloquently loomed silently, dark and unforgiving. But an early spring bloomed in the March night and, with it, all the magic of hope and forgiveness. PHOTO CREDITS: BECKIE FAIRCHILD. MARCH 29, 2016. ARTICLE BY JOSHUA HESTON & CALEB BRUBAKER. DR. HAYDEN HEAD has been a professor of English at College of the Ozarks for the last 17 years. He and his wife, Sue, and their two children, Heno and Lanie, moved back to the Ozarks from Irving, Texas, where Hayden earned his doctorate from the Institute of Philosophic Studies at the University of Dallas. Prior to their move to Irving, Hayden and Sue worked with Hayden’s parents, Heno and Jane Head, who owned and operated Camp Soaring Hawk — located not too far from Monett, Missouri. Since that time, the camp changed hands and is now known as Camp Barnabas. Hayden and Sue met there over 40 years ago. 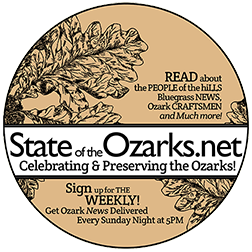 “Like so many Ozarkers, I love the story of Shepherd of the Hills! I’ve even had the chance to teach it a couple of times to my students in American literature. And I confess to a lifelong love of musicals. Thanks to Stan Beard, I’m finally beginning to hope that my love for musicals and this story will make it to the stage. I will never forget listening to Stan’s score for the first time — with tears in my eyes — and thanking the Lord that I could work with such a talented composer.” Thank you for joining in what has been a labor of love. Long live the Shepherd! 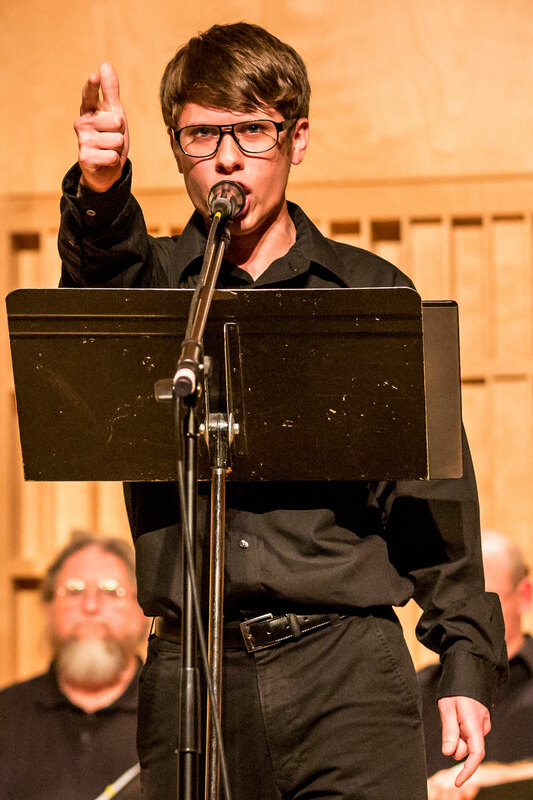 STAN BEARD is a musician, vocalist, arranger, composer, and often not one at a time! Stan has performed in concert halls in every state in the USA and in more than two dozen other countries. Appropriately enough, this Pennsylvania native began his career with renowned entertainer, Fred Waring and the Pennsylvanians, becoming the group’s youngest choral director at age 20. The stages and studios of California then drew Stan to a musical world that ranged from his tenure with The Carol Burnett Show, and tours with the likes of Ray Conniff and Doc Severinsen, to singing with Streisand and Sinatra. His varied skills have well-served his long association with Disney on Ice, where has been musical director for more than three decades. “Just try directing Goofy in Mandarin Chinese, Aladdin in Dutch, and Donald Duck in Italian, without cracking up! I dare ya!” He has written or produced thousands of commercial jingles (American Airlines to Zenith TVs). Several films and TV movies carry his name right after the words “Music by…”. Here in Branson, it has been 21 years since Stan composed the title song and score for “Listen to the River” to open Silver Dollar City’s Opera House. 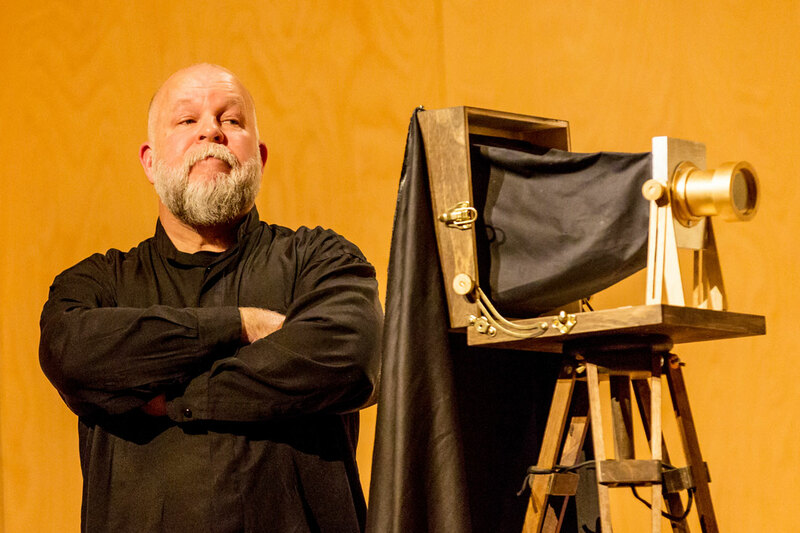 Since then his music has graced SDC’s productions of A Dickens Christmas Carol, It’s A Wonderful Life, Headin’ West, and the Living Nativity, as well as parades and other events at the park.